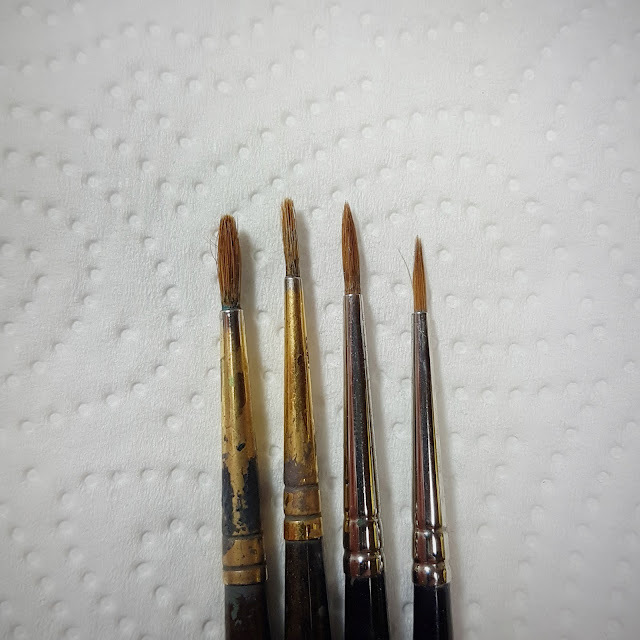 Every hobbyist encounters someday the problem that the shape of the brushes and their condition to paint properly comes to an end. 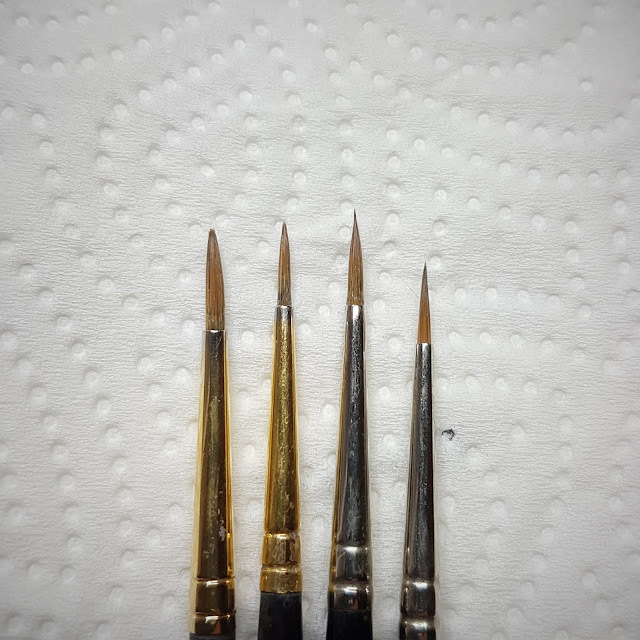 In my experience, it takes some time till a hobbyist thinks about brush maintenance to extend the life of their brushes and always keep the tip in the best shape. Therefore I will shed some light on this topic. In this article, I am reviewing two products from the company Abteilung 502: The "Magic Potion for Brushes" (ABT117) and the "Magic Gel for Brushes" (ABT114). These two products are for brush care only and come in a plastic bottle with screw cap and in a tin with a screw cap. The "Magic Potion for Brushes" is a high-quality brush cleaner, which, in addition to cleaning, also helps care for the brush. It contains no solvents no alcohols that can damage synthetic or natural brush´s hair. It´s recommended to dip the tip of the brush in this liquid for 24 hours for deep cleaning and restoration and repeat the process if necessary with seriously damaged brushes. 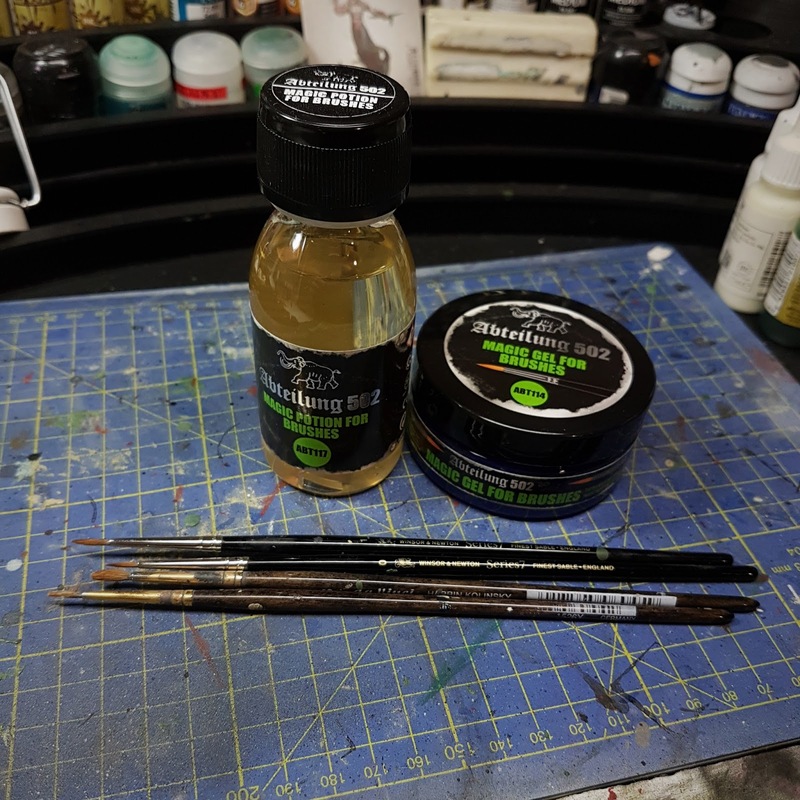 For testing purposes I used 2 very old "da Vinci Harbin Kolinsky" size 3 and 2 brushes as well as 2 rather poor looking "Winsor & Newton Series 7" size 1 and 0 brushes. They haven`t been cared much for and are loaded with paint residues and the tip is everything but sharp. I am curious about the cleaning tools you use? Tell me about it and if you have any experience with these products I am keen on your opinion, too. Nice review. I was expecting them to be a bit more expensive, I was quite surprised when I followed the links. I might pick some up to see if I can rejuvinate some of my old tired brushes (and keep my current brushes fresh). There looks to be some interesting products on the Abteilung 502 store, I'm pretty sure I saw some of the oils being used in a video recently.